All of our photographers are provided high quality equipment, and trained to use the same techniques and approach for Real Estate Photography. We meet frequently as a team to review our work and ensure unparalleled consistency. We’re equipped with a 10-22mm lens, perfectly suited for interior real estate photography. Proper exposure is essential for accurate colour replication, bright rooms, and transparent windows. We balance colour and exposure, correct for lens distortion and ensure your photos are straight and true. Your photo set is available for download in two sizes, one optimized for website usage and the other for print material. In addition, our HD property showcase will support all screen sizes and resolutions. No downloading is necessary with our Matrix ® photo upload service and our print brochure system. 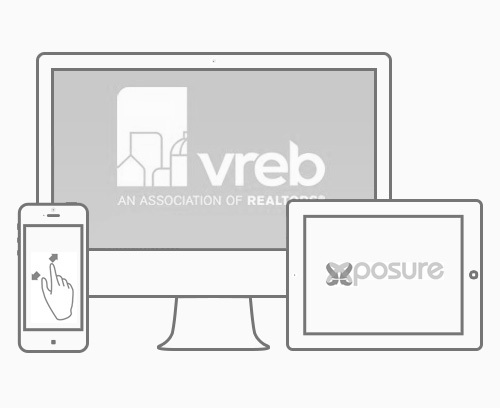 VREB agents can publish photos directly to Matrix ® within seconds of choosing their set and seamlessly build print brochures in our template driven system or publish to other popular integrations such as Xposure. What is HDR Photography and do you provide it? HDR stands for “High Dynamic Range”, a technique used to obtain light/exposure balance by combining multiple exposures into one photo. We do occasionally employ HDR if necessary, but more commonly opt for a fill flash to balance lighting. Do you photograph for Vacation Rentals? Yes, we charge a site-visit/travel fee of $35 and our regular rate of $4/photo applies. Will you upload my photos to XposureApp? The option to seamlessly publish your high resolution media (photos, floorplan and video) to XposureApp is available to clients who use the XposureApp service (learn more). We are not affiliated with XposureApp. Can I use your photos in my portfolio, website or advertisments? If you purchase a perpetual use licence from us then absolutely! Perpetual use licences are available for $10 per photo. The single use licence ($4/photo) is for marketing for sale/rental of the specific property.